Okatsune secateurs are the No. 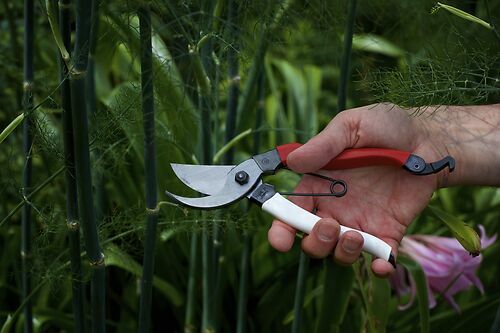 1 choice for professional gardeners in Japan; they’re simple, sharp and strong. Unlike western brands, which rely on cushioning and gearing for a smooth feel, these have a more direct action, resulting in a very clean, efficient cut. The big chunky catch at the bottom has a crisp action that’s easy to use, even with cold wet hands or muddy gloves, and the spring is well secured and never accidentally pops out. Red and white handles? Red shows up in daylight, white at night, for all you nocturnal gardeners. Standard size fits most, while the small model is great for those with smaller hands or as a second pair and for flowers in the house etc. Large size have longer handles giving you more leverage. Niwaki Tip: Fed up with felco? Give them a go!